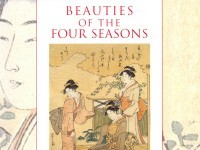 This series was issued over several years from around 1772, and was the most popular series produced by Koryūsai. 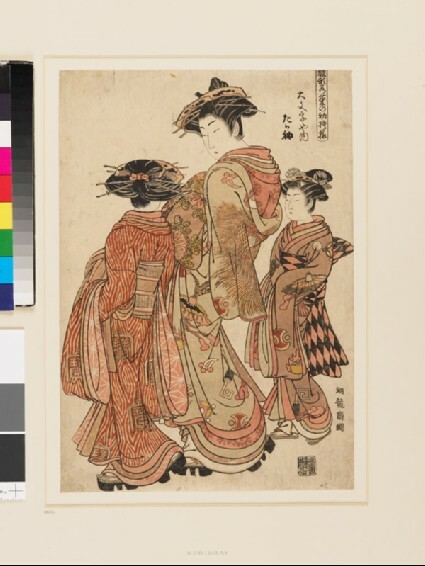 The oiran (the highest rank of the courtesans) Tagasode of Daimonji-ya is depicted wearing a kimono with the latest designs and is standing between her two kamuro who are also wearing new fashions of kimono and obi (sash). This print is one of the designs of spring from the series of Hinagata wakana no hatsumoyō, which consists of more than a hundred prints. The illustrations were especially for the courtesans of Yoshiwara during the New Year. The designs of her kimono, obi, ornamental combs and hairpins are beautifully depicted and Tagasode herself is consciously posing in order to introduce some new patterns, reminding us of the fashion models of today. The design of the kimono worn by the oiran and the kamuro (lowest rank) on the left are in pink and purple kimono. The design on the outer garment of both the oiran and the kamuro on her right hand side is called takara-zukushi, which is a symbol of good fortune.